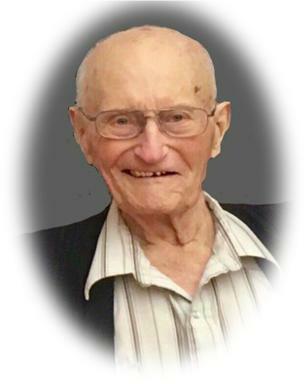 William - September 22, 1923-January 15, 2019: It is with sadness that the family announces the passing of their father, grandfather, great-grandfather, uncle, and friend. William is predeceased by his parents, Dmytro and Mary Koszman, his wife Anna, brothers Peter, Paul and Theodore (Ted), sisters Sophie, Kathryn and Anne, numerous brothers-in-law and sisters-in-law. He leaves to mourn his passing: son Maurice (Judy), daughters Rosanne (Terry), and Cathy (Jim); 5 grandchildren, 9 great-grandchildren; sisters-in-law Bertha Koszman, Cristine Herlick and Betty Herlick, and many nieces, nephews and friends. Mom and Dad lived on the farm near Tribune where they raised their family. Dad was very handy with his hands, loved farming and had a love of woodworking. He was an avid community volunteer, was a councilor for the R.M. of Souris Valley, Saskatchewan Wheat Pool, school board, the Tribune Telephone Company, Knights of Columbus, church cantor, and the PFRA Committee. In 2003 mom and dad sold the farm, purchased a home in Weyburn and then into a condo in 2014. A Prayer Service for Anna and William was held Sunday, January 20, 2019 at 7:00 p.m. from RD Family Funeral Chapel, Weyburn, SK. A Funeral Service for Anna and William was held Monday, January 21, 2019 at 1:00 p.m. from St. Mary's Roman Catholic Church, Tribune, SK with Rev. Fr. Andrei Kachur officiating. A Private Family burial was held at the Holy Family Ukrainian Catholic Cemetery, Tribune, SK. In lieu of flowers, family and friends so wishing, charitable donations in memory of Anna and William may be made to the Heart & Stroke Foundation of Saskatchewan, Unit 26, 1738 Quebec Avenue, Saskatoon, SK, S7K 1V9 or the Tribune Community Hall, Tribune, SK, S0C 2M0.